in 1997 apple computer's advertising agency tbwa/chiat/day originated the think different campaign principally to encourage those who considered themselves modern day thinkers to look at an alternative to the microsoft windows computing platform. leaving aside the fact that it should have been more correctly formed as think differently (advertising agencies rarely let something as trivial as correct use of the english language stand in the way of a campaign), any long-term apple user would have been already inured to this approach of having to think different(ly). once categorised under the heading not invented here, products emanating from 1 infinite loop had rarely been seen to conform to any notional standard. apple used processors that would not support anyhting windows-based, video card slots that varied from the more common denominator and featured expansion sockets that demanded proprietary hardware (scsi anyone?). it was doubtless something of a great irritation to those providing third-party items for the apple market to have need of manufacturing and offering two distinct flavours of the same product. and every bit as irritating for those of us who had hoped to purchase an example of said item for a similar price to those using a windows-based computer. however, all is now a tad rosier in the computing garden, with current apple models containing intel inside and even the real practicality of running the windows operating system on an imac or macbook air. yet thinking different(ly) is not confined to the world of zeros and ones, though not all fancy the expense of a large advertising campaign to proclaim so as loudly as apple. in the case currently under discussion, take sports apparel company ashmei. i have previously reviewed their excellent softshell jacket and merino s/s jersey, but while perusing the ashmei website, i was scared enough to come across the price tag on their bibshorts. given the quality of the previously mentioned two items, that their bibshorts would be every bit as efficacious was never really in doubt. but £235 for bibshorts from a company that is hardly a household name? you would seriously have to wonder how they came by such a hefty price tag. i will admit that, generally speaking, thewashingmachinepost is somewhat price agnostic for the following reason: if we accept that ashmei's bibshorts do indeed cost well north of £200, we must also accept that no amount of jumping up and down is likely to change that fact. granted, if they failed to live up to those numbers, there may be cause for concern either on our part or theirs, but the folks at ashmei are very unlikely to knock a few quid off just because the advertised price has made our eyes water. 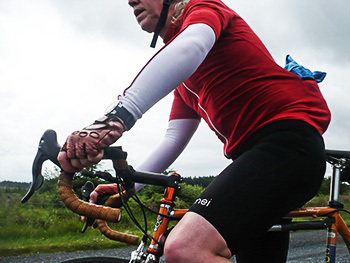 if it's a pair of ashmei bibs that you desire, that's what they cost. i'm pretty sure aston martin wouldn't bring their prices down just because i couldn't afford one. 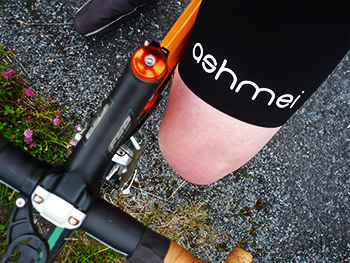 so what's different about ashmei's bibshorts that separates them from the likes of rapha, assos and castelli? according to ashmei's stuart brooke "The fabric has 40% stretch instead of the standard 16-20% so that we can compress your thigh muscle to help drive fresh blood and maintain your performance. "Additionally this micro fibre also resists wind so that your muscles stay warmer, again providing better performance. And we have laser cut the hem and left off the silicone grip; this is not required as our short is much more compressed.ÊBeing so tightly woven, the material is water resistant so if you get caught in drizzle it will bead off and the spray from the back wheel will not soak into the fibres." could all that really be true? would i, of all people, actually notice if my muscles were being compressed and if so, would it make any difference? the ashmei bibshorts really are somewhat different to the others i have in my cycling wardrobe. for starters, that compression fabric is nothing at all like lycra; it's almost paper-thin and rustles quietly when you lift the shorts from the packaging. and true enough, there is no gripper of any description inside the hem, meaning they're a lot easier to get on than several i could mention. i own a couple of pairs where the silicone gloop is so tacky, that the shorts scarcely make it past my ankles without physical assistance. however, in all other cases, that tackiness means the leg never rides up when cycling. surely no gloop at all would be left wanting? stuart also advised me that the bibs would feel very tight for the first few rides, taking a few washes to soften them and relax the fibres. he was of course correct, leading to an almost embarrassing situation where i thought i might just have requested the wrong size (small). however, when stuart is right, he's right, and after about four rides and subsequent washings, they have started to adopt the demeanour of a second skin. the shorts do profess a waistline of sorts which could offset the more usual svelte profile engendered by others should you havae bumpy bits where you'd prefer not to have bumpy bits, but i'm presuming that may tie-in with their compression ambitions. either way, the overall fit was close to impeccable. visually, the fabric does not offer the flexibility that you'd expect with lycra (some more than others), but appearances can be deceptive. in this case, they certainly were; while i would never recommend riding without shorts (unless on a naked bike ride), it was only a matter of kilometres before i forgot they were there. and the lack of any gloop on the hems seems not to have impinged on their ability to keep the legs precisely where you'd want them to be. (nor did i have red marks above the knee on removal). ashmei's bibs feature a bespoke chamois pad, apparently built from 3d moulded high-density foam that doesn't absorb moisture. it's a long time since i experienced any discomfort from a chamois pad, and i'm pleased to say this one looks like continuing that trend. oddly enough, and it may be simply due to a meeting of discombobulated shapes, the shorts did not play too happily with a brooks cambium carve saddle (the one with the hole in the middle). though the latter has proved perfectly comfortable with other makes of bibshort, and the ashmei bibs have been delightful with standard saddles, this particular combination hasn't quite gelled (if you'll pardon the pun). of course, it may be that brand new shorts on a brand new saddle might take time to get to know each other. i'll get back to you on that one. otherwise, these have been a great joy in which to cycle. the fabric is indeed water resistant; having been caught in more than just a single shower over the past weeks, it's oddly comforting to watch beads of rain settle on the fabric before running off harmlessly. of course, a subsequently torrential downpour spared neither rider nor riding apparel. i cannot truthfully testify to the averred compression feature. i tend to think that it's something that ought really to work away in the background rather than making me feel as if my legs were being strangled, in which case, it was quite likely doing so. i am not a competitive nor particularly fast rider, so it would take a team of scientists and a truckload of equipment to check the veracity of their contention. i'm happy to accept their word for it. at the risk of breaking my own reviewing checklist, do i think the price is a little on the high side? quite probably yes, but the very best never comes cheap. 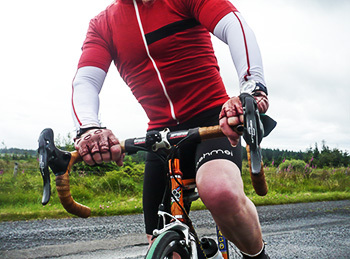 the ashmei bibs are certainly different enough to make you look more than twice, and they're easily amongst the best on the market. if you've got the money, i seriously doubt you'll be disappointed. and it's always another conversation for the coffee stop.